Congratulations on the approval of your Study Away Proposal. This page will assist faculty leaders in months leading up to the final departure. There are a few institutional requirements to verify your standing at the College. We ask that this be completed no later than October 1st. the Department of Experiential Learning will also verify with Human Resources that all faculty leaders do not have an active Professional Improvement Plan. The Experiential Learning staff will work with each faculty leader and printing services to create marketing materials for distribution during classes and campus events. 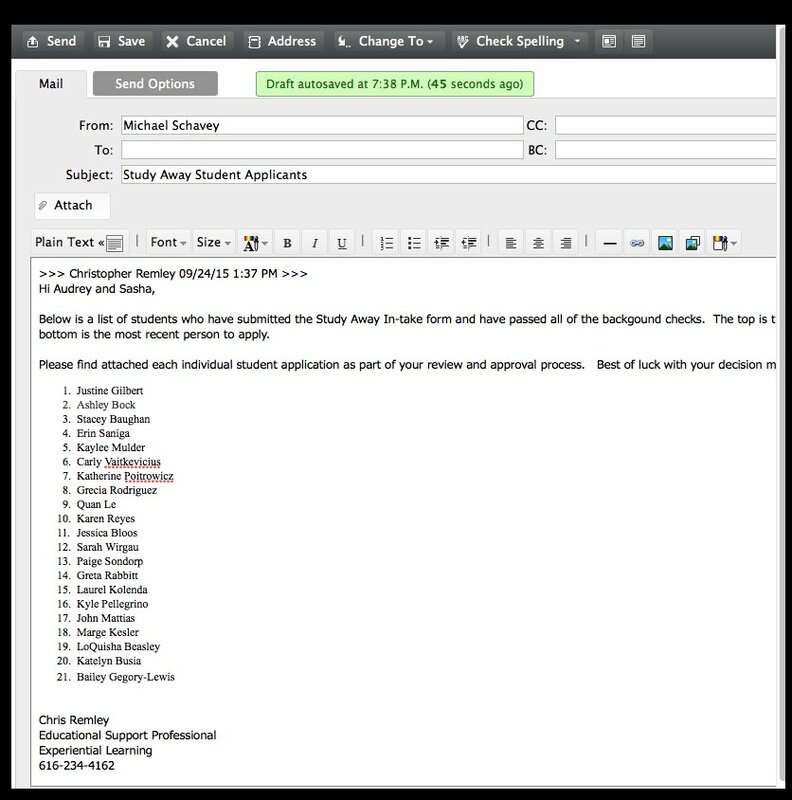 Experiential Learning staff manages the application process using the Student Intake Form through OrgSync. preference is given to degree seeking students, first time study away participants. we recommend faculty to prepare for a group size of 12-16 students. HU 219 has a cap of (16). if the group size exceeds the enrollment limit, the faculty leader must submit a rationale to the Dean of Instructional Support for approval. Experiential Learning staff will work with the faculty leader(s) to verify the payment schedule to ensure funds are collected to meet third party provider deadlines. payments are typically collected during the months of October-February and are in alignment with the provider contract payment deadlines. staff will communicate to students of their remaining balance as well as keeping faculty leader(s) informed. we strongly encourage faculty to be aware of and support students making timely payments. students must withdraw from the Study Away experience - IN WRITING- as soon as possible. students are responsible for any unrecoverable fees incurred on their behalf which may include, but not limited to, expenses associated with airfare and lodging reservations. Student orientations are required prior to departure. we strongly encourage faculty leader(s) to schedule the Chief of Police, the Director of Student Life and Conduct and a representative from Counseling to participate in your orientations. All contracts are required to be reviewed and approved by our General Counsel and Executive Director of Financial Services. Once the contracts have been approved, Experiential Learning staff will work with the faculty leader and specifically with the provider to process invoices through our Financial Services department. Students who are interested in extending their travel beyond the dates of the study away experience must complete the Extended Stay Form. Students will need to inform family and friends of their extended stay; secure the necessary health care coverage for my extended stay and complete any remaining assignments/expectations of the affiliated study away course work. GRCC reserves the right to cancel any program at any time in the event of circumstances beyond our control that may threaten the safety of our students or faculty. Cancellation by GRCC due to unexpected political or economic events will result in a full refund of all tuition, fees, and housing costs paid by participants before the beginning of a Study Away program. This is every bit as important as anything else that goes into leading a study away experience. when you finish your experience, talk over what went well and didn't go well with a colleague to make changes for next time. share your best practices around reflection, developing partnerships, gaining student buy-in, etc.